Because of its proximity to the sea, China's cuisine includes a lot of seafood-based dishes. Among them is fish balls, which are similar to meatballs except that fish is used rather than ground beef. Fish balls are commonly sold by street vendors, but you can make this dish at home. 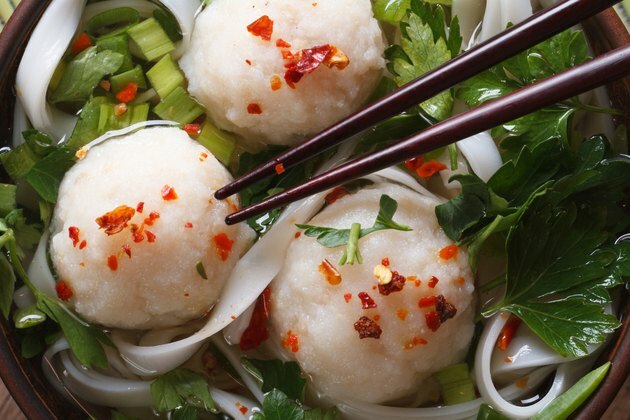 Chinese fish balls are rich in protein and, unlike meatballs, low in fat. Chinese fish balls are low in calories, as an 100-gram serving of the food contains just 77 calories. That amount comprises less than 4 percent of the daily recommended intake of 2,000 and makes fish balls a possible food choice for those looking to lose weight. You could burn the calories in 100 gram of Chinese fish balls through eight minutes of jogging or five minutes of jumping rope. As with other dishes made of seafood, Chinese fish balls are rich in protein. An 100-gram serving of Chinese fish balls contains 10 gram of protein, which is more than 1.5-times the amount in an egg. Protein is vital for your health because it provides your body with amino acids, the molecular building blocks of your cells and tissues. Chinese fish balls differ from traditional American meatballs in that they are low in fat. Each 100-gram serving of these fish balls contains just 1 gram of fat, with no saturated fat. While fat is calorie-dense, it is important for providing energy, aiding in vitamin absorption and ensuring healthy growth, so the Institute of Medicine recommends eating a diet comprised of between 20 and 35 percent of calories from fat. Chinese fish balls are relatively low in carbohydrates, with 8 grams per 100-gram serving. If you're on a low-carbohydrate diet, this may not be an ideal choice; two 100 gram servings of Chinese fish balls provides the same amount of carbohydrates as a slice of bread. While Chinese fish balls provide some nutritional benefits, they are significant sources of vitamins and minerals. Your body needs vitamins and minerals to carry out vital metabolic functions for optimal health.